After finding that many acoustic screening solutions in the market restricted airflow and ventilation, Murray Goulburn decided to go with acoustic louvres from Flexshield – a screening solution that met their noise reduction, ventilation and aesthetic goals. Available in a wide range of materials and finishes, Flexshield's sonic louvres are tailor-made to suit all size, acoustic and airflow requirements. 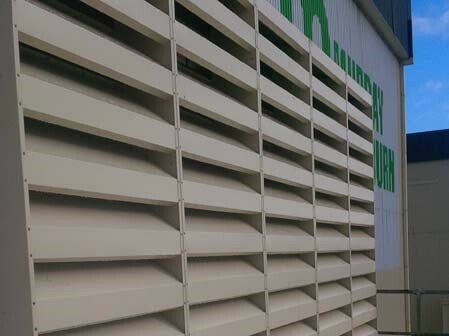 These acoustic louvres can be supplied as modular acoustic walls, or fabricated into acoustic louvre gates or doors. Flexshield's acoustic louvres have multiple applications including acoustic enclosures for air-con intake; acoustic enclosures for generators; complete standalone acoustic plant rooms; central ventilation systems; workshop ventilation; cooling towers; wall grilles; and acoustic ventilation screens. Flexshield services the whole of Australia, New Zealand, Australasia and several international markets.